Companies like Apple and Fitbit may have helped start the wearables boom, but the initial popularity of fitness trackers and smartwatches has led to an explosion of health wearables that go way beyond the simplicity of recording steps and heart rate. Many of these new tools are made by startups that see an opportunity in the health space to assist patients and other individuals. They aim to monitor chronic conditions like diabetes, reduce workplace injuries, or help the elderly stay safe. In a recent report, the Consumer Technology Association estimates that medical-grade wearables could generate a new competitive market with projected sales in the billions of dollars while also saving money in healthcare costs. With a host of new companies flooding this space – all making big promises – it can be difficult to pick out the hope from the hype. To that end, here are five health startups creating interesting and promising wearable tools that we think you really need to know about. When older adults begin to lose their independence, either due to advanced age or disease, it can be an emotionally distressing experience. Reemo Health, a startup based in Minneapolis, MN, began with a desire to help the elderly regain some of that independence with a remote monitoring platform. "Our company started with the idea of having our parents and grandparents be in more control of their health and safety, both at home and on the go," Matt Yonan, VP of Marketing at Reemo Health, tells us. "That's what led us to our solution of a smartwatch as something that could support their independence as they age." Reemo's customised platform for seniors runs on a Samsung Gear smartwatch to monitor heart rate and location, and enable push-button 911 calls. Beyond collaboration with Samsung, the startup announced two new partnerships in January that will add key features later this year. Security giant ADT will provide its personal emergency response system for Reemo users, who can connect to a specially-trained agent with a simple tap. And Teradata's analytics technology will look for correlations in the data to tell a story about the user's overall health. The product will launch in the beginning of April this year as a subscription service and will include a Samsung Gear watch, Verizon cell service, and access to ADT's personal emergency response system. A recent report by Juniper Research predicts that the rise of smart clothing will surpass the growth of conventional activity trackers by 2022. While the sales of clothing-based wearables is forecasted to jump more than 550% in the next five years, the activity tracker market is only set to grow by 20% in the same time span. Hoping to ride on such future success is Canadian startup Myant, maker of SKIIN smart clothing. "We knit sensors and actuators directly into the clothing in a way to make them feel just like normal clothing," says Steve Aitken, Director of Product at Myant. "All our products are being designed to look and feel just like everyday clothing and textiles you're used to using." The SKIIN platform measures heart rate, temperature, activity, hydration and body fat. In January, the company opened up pre-orders for its first consumer product: smart underwear. But Myant has plans to go far beyond fitness-tracking skivvies, with the eventual goal to integrate actuators (eg electric muscle stimulation, compression, heat) for medical and gaming applications. "The combination of sensing and actuation will open up a wide variety of new use cases for SKIIN's products, like delivering remote therapy, adding the sense of touch in AR/VR worlds, or regenerating astronaut's muscles while on the long trip to Mars," says Aitken. When Fitbit makes an investment of $6 million into a lesser-known startup, the wearable industry perks up and takes notice. The deal with Silicon Valley-based Sano, announced in January, is Fitbit's first-ever startup investment. Fitbit has already partnered with Medtronic and Dexcom, maker of continuous glucose monitors, to integrate glucose levels and activity tracking into one application. In a related effort, Sano is developing a wearable biometric sensor that continuously measures blood glucose levels to help control diabetes. The company claims the sensor can "capture and transmit blood chemistry data continuously to virtually any device." It uses tiny needles called microstructures on the underside of a small patch to measure interstitial fluid, or the fluid that fills the space between cells. 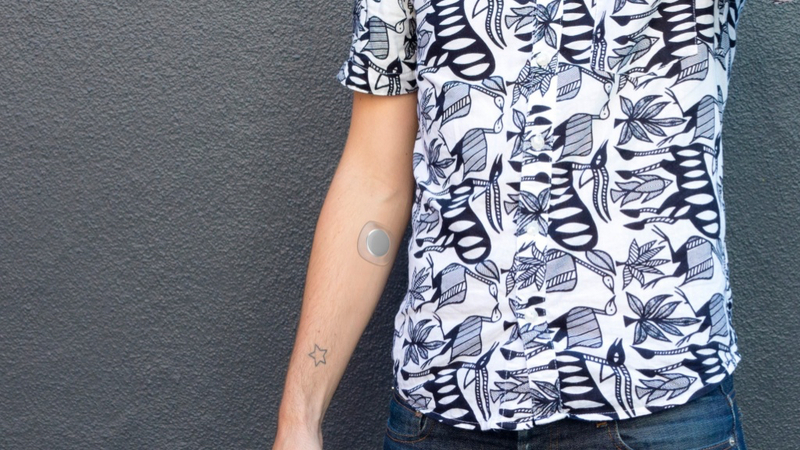 According to Gizmodo, Sano plans to launch a beta release this summer marketed towards non-diabetics for "metabolic insight," with a medical-grade, FDA-approved version to come afterwards. Sano did not respond to our request for comment, but the company spoke about its technology in a presentation at the Hyper Wellbeing conference in 2016, the slides from which can be found here. Another clothing-based wearable startup making waves is NYC-based Nanowear, a company that develops medical-grade smart textiles. Instead of everyday fitness tracking, it focuses on textile-based solutions for the cardiac, neurological, diabetic and sports medicine diagnostics monitoring markets. In 2016, it received FDA approval for its first product, a remote cardiac monitoring undergarment called SimplECG. "[Nanowear has made] the first FDA-approved piece of clothing as a medical device – essentially shirts which include the ability to monitor heart rate," says Chris Steel, global head of healthcare at PA Consulting Group. "This will replace uncomfortable devices such as Holter monitors which are typically worn for only short periods of time and are not 'connected'." SimplECG and future products are made to capture and transmit diagnostic data in a non-invasive, patient-friendly manner. Earlier this year, the company announced an exclusive supply chain partnership with biomaterials manufacturer The Secant Group for scaled manufacturing and production of its medical-grade clothing. According to a report by the US Bureau of Labor Statistics, there were approximately 2.9 million nonfatal workplace injuries and illnesses in 2016. As a possible solution, Kinetic has created a smart wearable that automatically detects high-risk postures and provides workers with feedback to reduce the likelihood of injury. The Kinetic REFLEX consists of a band worn on the wrist and a sensor that can be integrated with a back brace. "Kinetic is a Boston-based company that has created wearable technology in the workplace to promote safe movement, which is especially important for people doing physical jobs," PA Consulting Group's Chris Steel tells Wareable. "The company is interesting because the model to benefit is clear, either directly through reduction in workers' compensation and reduced sick leave, or indirectly through a reduction in the overall cost of healthcare provision for their employees." The sensor detects the user's biomechanics, while Kinetic's algorithms aim to identify excessive bending, twisting, or reaching for real-time feedback. Also, a dashboard allows management to see the risk profile of the workplace in order to reduce injuries long-term. REFLEX remains in pilot mode, but has performed several testing projects at warehouses across the country. One case study highlights a pilot run at the distribution facilities of Crane Worldwide Logistics, a large third-party logistics company that serves the oil and gas industry. It cited an 84% overall improvement across the workforce in the number of high-risk postures after wearing REFLEX – so all signs are promising.